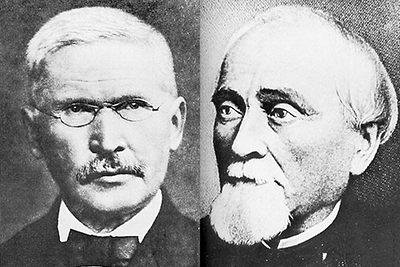 Friedrich Wilhelm Raiffeisen and Hermann Schulze-Delitzsch, were responsible for creating the first true credit unions in Germany in 1852 and 1864. During 1849, Raiffeisen founded a credit society in Flammersfeld, Germany, but it depended on the charity of wealthy men for its support. Raiffeisen remained committed to that concept until 1864, when he organized a new credit union along principles still fundamental today. The credit societies in Germany, and similar institutions founded by Luigi Luzzatti in Italy, were the forerunners of the large cooperative "banks" that abound in Europe today. In 1871, credit union legislation was considered in Massachusetts. This attempt and later efforts in the 19th century to start U.S. credit unions were not very successful. It was a Canadian who transplanted the credit union to the Western Hemisphere. In 1900, Alphonse Desjardins organized a credit union (caisse populaire) in Levis, Quebec. The reasons were the same as those in Germany 50 years before. People were poor, interest rates were financially crippling, and the credit union offered a way out. That first Canadian credit union was small by modern standards. The first savings deposit was only 10 cents; the first collection from all the members totaled only $26. Even today, in some countries, credit unions start small. But Desjardins persevered and devoted a good part of his life to credit union development in North America. He founded other credit unions, including the first one in the United States, in 1909 in New Hampshire. Two Americans became profoundly influenced by Desjardins' efforts: Pierre Jay, the Massachusetts banking commissioner and Edward A. Filene, a Boston merchant. Filene discovered credit unions in a village in India in 1907. He had stopped in Calcutta and met a government official who took Filene out into the countryside. There Filene first observed a village credit union in operation and was immediately interested. Back home again, he began reading about credit unions to strengthen his knowledge. Filene was perhaps the ideal American to give the credit union idea a push. He was a progressive thinker for his time. He had begun profit-sharing plans for his employees, instituted other novel fringe benefit programs, was the founder of the "bargain basement" idea in department store operation, allowed his employees to engage in collective bargaining and arbitration,established minimum wages for female workers, and advocated a five-day, 40-hour week. In the early 1900s, such ideas were revolutionary. Besides his creative approach to business, Filene was also one of the founders of the U.S. Chamber of Commerce. As banking commissioner, Pierre Jay had made a study of unauthorized banking practices in Massachusetts. He learned that several groups of employees in the commonwealth had started their own savings and loan organizations. These groups resembled what Henry Wolff, a European, had described as "people's banks." Jay believed that these small associations were providing a needed service, but he wanted to recommend a way to make them legal. From Wolff's writings, Jay turned to the work of Desjardins and others. He began a chain of correspondence with Desjardins. This resulted in a 1908 conference in Boston in which Desjardins, Jay, Filene and other public-spirited citizens participated. 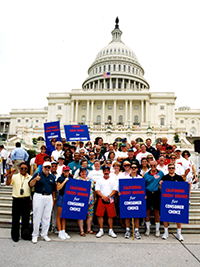 Working with Desjardins, Jay prepared the legislation for what was to become the first general state credit union act in the United States. A person's desire to repay (character) would be considered more important than the ability (income) to repay; they were, after all, borrowing their own money and that of their friends. 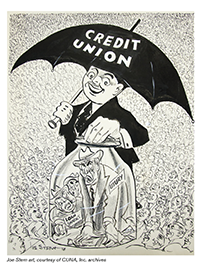 These principles still govern most of the credit unions in the world. The credit union system is made up of organizations at the local, state, and national levels. Credit unions, corporate credit unions, chapters, leagues, and league service corporations serve member needs on the local and state levels. On the national level, Credit Union National Association and its affiliates, CUNA Service Group and U.S. Central Credit Union, provide the leadership, products, and services credit unions need to compete effectively in today's financial marketplace. The credit union system gives credit unions the strongest support network in the financial services world. Through this cooperative effort, credit unions of all sizes combine their individual strengths and can offer their members a broad range of sophisticated financial services. The programs, products, and services of the credit union system are available to credit unions through league affiliation, and are supported by fees and dues.